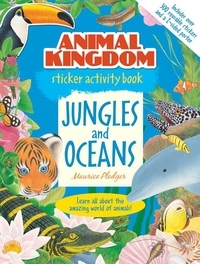 Animal Kingdom: Jungles and Oceans introduces young children to a variety of amazing creatures through fun sticker activities. The colorful artwork of nature illustrator Maurice Pledger is paired with fun sticker activities in Animal Kingdom: Jungles and Oceans. Children ages 3 and up will learn all about amazing creatures and their habitats. Discover facts about animals from across the globe--where they live, what they eat, and how they survive in their habitats. The reusable stickers can be matched to the illustrations, added to scenes, or be used to decorate notebooks. * A 120-page book packed with fascinating facts about all sorts of jungle and ocean animals. * More than 300 reusable stickers for a variety of activities. * A two-sided 22-by-16-inch poster.